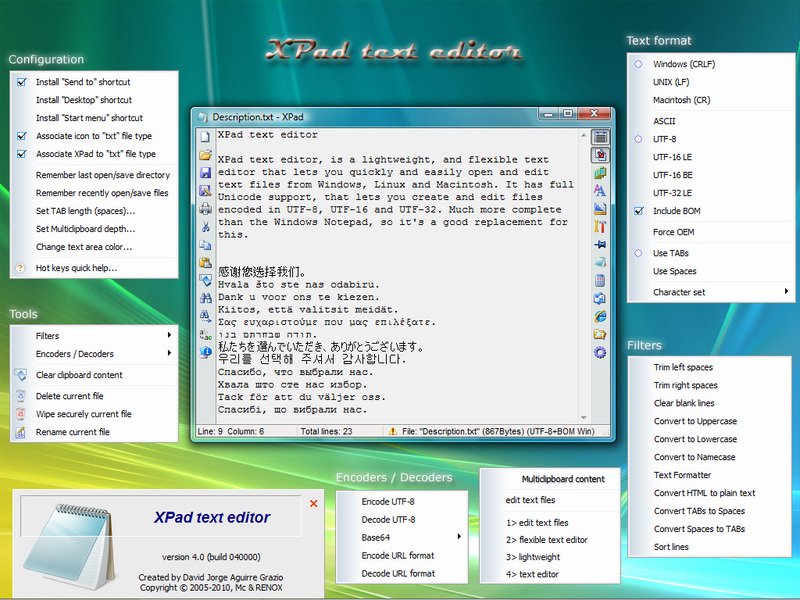 XPad text editor, is a lightweight, and flexible text editor that lets you quickly and easily open and edit text files from Windows, Linux and Macintosh. It has full Unicode support, that lets you create and edit files encoded in UTF-8, UTF-16 and UTF-32. Much more complete than the Windows Notepad, so it's a good replacement for this. XPad, a new step in the evolution of text editors. Automatic copy selection to clipboard. 100% Unicode compatible, enables users to load files with characters in Chinese, Japanese, Korean, Russian, etc. ASCII, UTF-8, UTF-16 Little-Endian, UTF-16 Big-Endian, UTF-32 Little-Endian, with and without BOM (Byte Order Mark). Windows, Linux (Unix) and Macintosh text file support. Tabulation in TABs or Spaces. Open web links, e-mails address or file paths just selecting it. And many other tools like, convert Tabs/Spaces, Uppercase/Lowercase/Namecase, Trim left or right spaces, sort lines, clear blank lines, convert HTML to plain text, clear clipboard, delete/wipe/rename current file, etc. · Environment: 32bit Windows 10, 8, 7, Vista, XP, etc. · Environment: 64bit Windows 10, 8, 7, Vista, XP, etc. If you find this software useful, you are invited to collaborate with its development. A good way to collaborate is through donations. The money of donations will be used in upgrading equipments and on helping me to take focus on the project development.